Donations and sponsorships are the entire source of funding for the Kailashzone Projects. Please help us to help others!! There are 262 Children aged below eighteen in 2005, we the organizations have helped 22 children in the boarding school at Kathmandu, Nepal in year 2006 and 2007. In 2008, we setup 3 schools at 3 Limi villages for hundreds children. The villages of Limi are located in a beautiful valley at the border western Tibet. 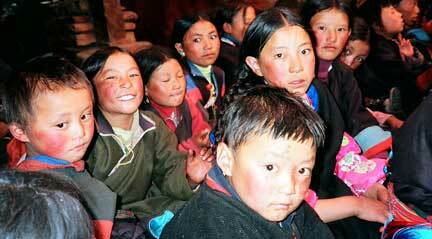 The people are ethnically Tibetans and possess some unique Tibetan culture, which are nolonger exist in Tibet because of the Cultural Revolution of China. Limi is part of Humla District, which is categorized as one of the least developed region in Nepal. It is a common knowledge that Nepal is the poorest country in the Asian continent. Some facts about the population over 1700 Limi are that they have no real hospital for sick, no proper school for children, no road for vehicles, no adequate power supply and not a single person has a decent governmental job. The villagers are fighting for everyday survival. Another truth is that the villagers don't feel lacking the things listed because they never had these in the past. Requested by the local chiefs and elders villagers of Limi, the school project is initiated by Kailashzone Charitable Foundation based in Kathmandu, Nepal and supported by Antakharana Society International in United States. Above photo was taken in July 2005 at the meeeting when Khenpo Tashi Kailsh: the chairperson of Kailashzone, and Deanna Camphel: the Executive Director of Antakharana, visited Limi to discuss the school project with the local chiefs and the villages' representatives and some agreements were made between the school project and the villagers. While Tashi and Deanna were in Limi, they collected information about purchasing building materials available locally and to assess required materials to be brought into Limi either a hylacapter or by animals. The main objective of the school is to break the cycle of illiteracy and to elimante the poverty by educating the younger generation how to make their home a better place to live and acquire their needs including education, health-care, and political rights and power. Building work of the Boarding School will be started in near future: Before then, Kailashzone Charitable Foundation and Antakharana Society International are responsible for raising funding for the school building and making a real school for the children where they will be provide education and basic needs for free of charge. You can help the school projects by making donation. If you are interested in becoming a sponsor, we request you to consider to pay for a part of the school project. The school project is entirely relying on donations and sponsorships. We need your help to help others! Donations and sponsorships are the entire source of funding for the school Projects. !! support to build the school ."